We are currently on 10.4.10 of OS X Tiger. One of the neat built-in features that is available is the ability to generate a PDF file from any application that can print. There is no extra utility to hunt down if looking for freeware, or expensive software to buy to enable this feature. Click on the PDF button. 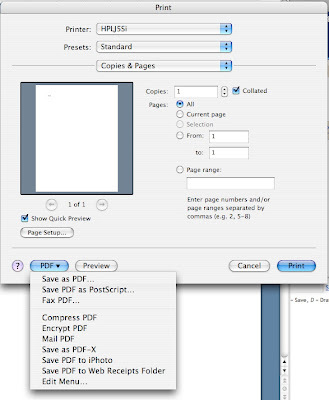 Click on "Save as PDF ..."
Name the new PDF document. The process is not unlike many PDF creators on the PC platform. Sometimes it is the little things that make a product experience that much better. This is one of those times.